In a small bowl, stir together the key lime yogurt and 1/4 cup agave. In a second bowl, stir together vanilla yogurt and 1/4 cup agave. In a medium bowl, stir together butter, sugar and crushed cereal. 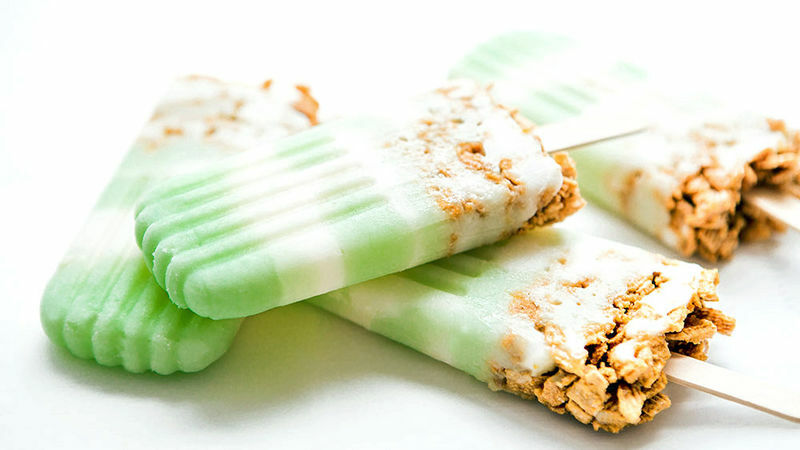 Using four popscicle molds, spoon layers of the lime and vanilla yogurt. When halfway full, alternate layers of yogurt with the crushed cereal. Finish with a final layer of cereal. Slide sticks into the center of each mold and freeze until firm, about 6-8 hours. When ready to serve, remove popscicles from plastic molds.